Previously, Baby Boomers were the top pet owners in the United States. Now, that is changing. 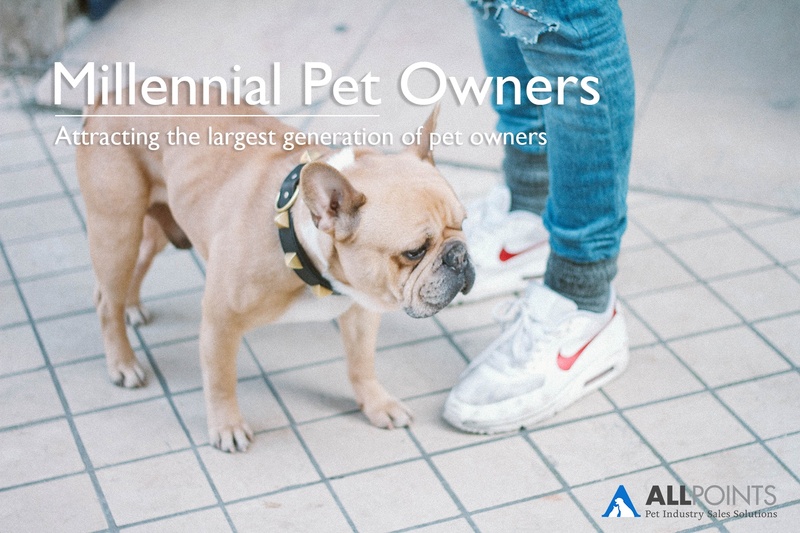 The American Pet Products Association (APPA) recently published the National Pet Owners Survey for 2015-2016 stating that Millennials now own 35.2% of pets in America whereas Baby Boomers own 32.8%. Not only that, but APPA also found that approximately 10% of current pet owners are actually new pet owners. It seems we are now at the point of transitioning between two generation of pet owners. What's unique about this particular transition is that one generation is almost being overlooked entirely: Generation X. Although they do make up a large portion of pet parents, it's the Boomers and the Millennials who are changing shopping habits so dramatically that retailers are being forced to change how they sell. As the largest portion of pet owning consumers transitions to a new generation, the question becomes: How do you target Millennial pet owners and not only attract them to your store, but keep them coming back? No matter what everyone is saying, Baby Boomers are still a large part of the market. We should not ignore them when it comes to marketing and pet product design. It's important for manufacturers to come up with solutions that make pet owning easier, especially as the generation ages. In fact, according to AARP, Baby Boomers are the ones credited with humanizing our pets, which is noteworthy as 90% of Americans consider their pets as a part of their family. Boomers still make up 32% of America's adult population and account for 55% of packaged goods sales. Additionally, 50% of them are likely to splurge on their pet. With these numbers, there's no doubt that Boomers are a still a large part of the market. Advantek is very aware of their buying power, and still works to ensure this generation is satisfied with their products. Related Article: Is Pet Tech the Future of the Pet Industry? For example, The Pet Gazebo allows pet owners to keep their dogs safely outdoors without the fear of escape and having to chase them around their neighborhood. Additionally, for the chicken-keeping Boomer, the Tractor House Chicken Coop allows for maximum mobility as the owner is able to easily wheel the coop around their backyard. While Boomers are still a large part of the market, there is definitely a rise in Millennial pet owners and the money they are spending on their pets. Therefore, this generation is definitely where manufacturers should be starting to focus. Millennials are not only the largest pet-owning generation, but they also spend the most as 76% of Millennials are willing to splurge on their pet. What does this mean? Marketing that more expensive high-end food or Italian-designed pet bed is just that much easier. Offer fun and exciting products for their pets! While the last one might seem like a no-brainer, sometimes we all get caught up with day-to-day workloads that we sometimes forget that we work for one of the most fun and exciting industries in the world! Why not take advantage of that, especially when the new biggest pet market is attracted to fun and exciting things? Advantek not only attracts the Boomer generation, but also offers a Rooftop Garden Chicken Coop which falls in-line with the all-natural trend. Why not grow your spinach to have a fresh and healthy omelet with your organic eggs, all facilitated by one product? Applaws also encourages a "pet parent" feeling by allowing cat owners to experience feeding their pet in a way that is similar to putting together a prepared, simple, and healthy meal for a child.